Check out Google’s latest attempt of letting you have a viable entertainment device in your living room named Chromecast. But, unfortunately only four apps will be supporting the technology at present: YouTube, Netflix, Google Music and Video from the Play Store. But, if you are not satisfied of what is provided, read on for some more tips for using your computer and Chrome browser as a work-around. Do not be mistaken. This device is not intended to be used as a WiFi receiver for sending content to your TV like a Roku or Xbox 360. 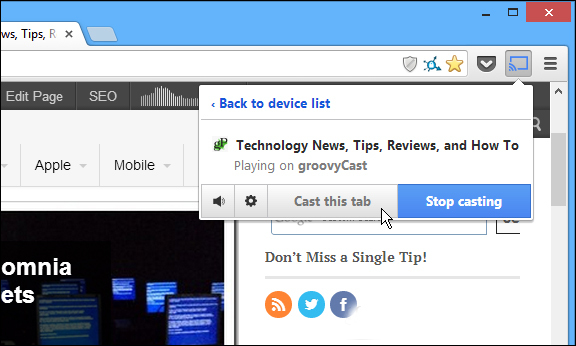 Follow the guidelines on how to stream your own media files to Chromecast. 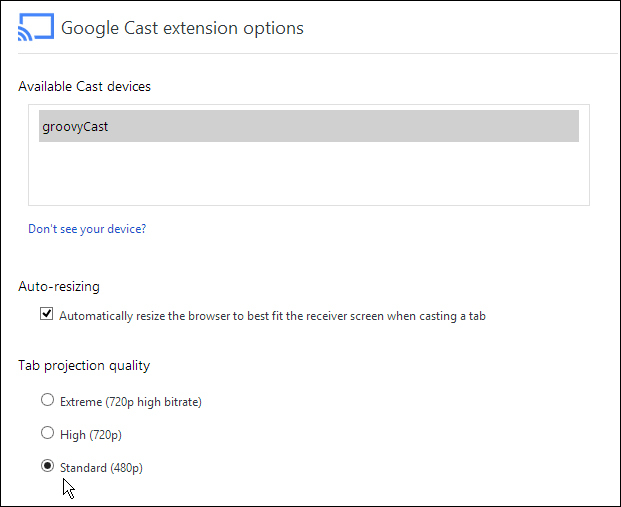 In fact you can stream a webpage to your TV with the Google Cast extension. Just navigate to the page you want to show on your big screen and click Cast this Tab. You may also stream your entire desktop over to the Chromecast to view on your HDTV with the Google Cast extension. Well, this function may not be handy for home use, will definitely for offices during presentations. It is an experimental feature and doesn’t support audio. Note that when you’re streaming your own media files to Chromecast, it does not mean it is as reliable as using apps meant for it like Netflix or YouTube. It also depends on the power of your WiFi router and how much of a load it has going on. Therefore, in case you’re having issue streaming something to it, you can decrease the projection quality. 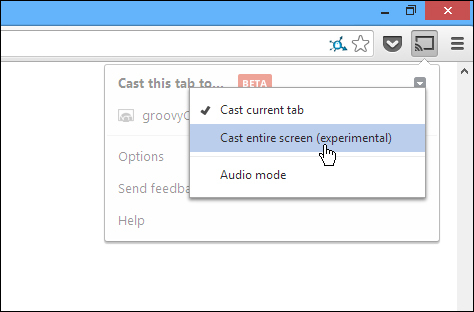 From the Cast extension go to Options > Tab Projection Quality; change the quality to 480p. If you are in search of additional hidden settings that you can tweak and customize, I guess you will need to get your geek on and do a bit of code hacking. Let’s see how! 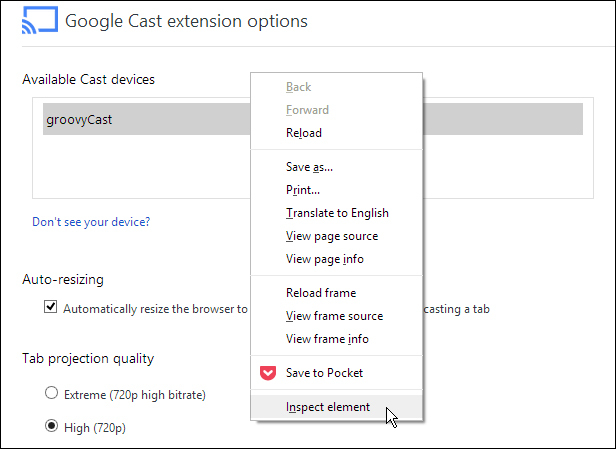 From the Google Cast Extension Options screen, right-click on the page and select Inspect Element. When the page element code opens at the bottom of the screen, expand the DIV where you see “quality == ‘custom’” and double click on “display: none” after “style=” and delete it. 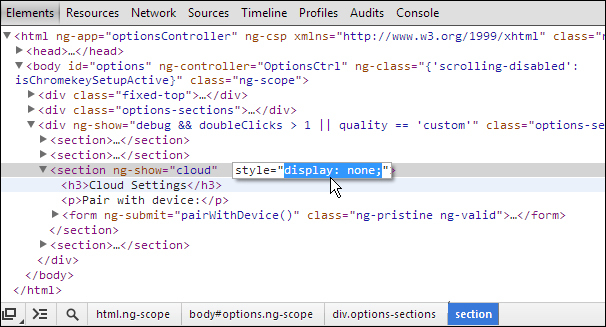 Follow the same steps under the <section ng-show=”cloud”” section as shown below. Now close out of the Inspect Elements section and scroll down on the page. You’ll now see a bunch of options that were previously hidden – including developer settings. This list starts with Custom Mirroring Settings. Note: These settings are mostly played with by advanced users. I have never come across users complaining that they are getting any improvements to streaming by tweaking these settings. But, you are always free to experiment. 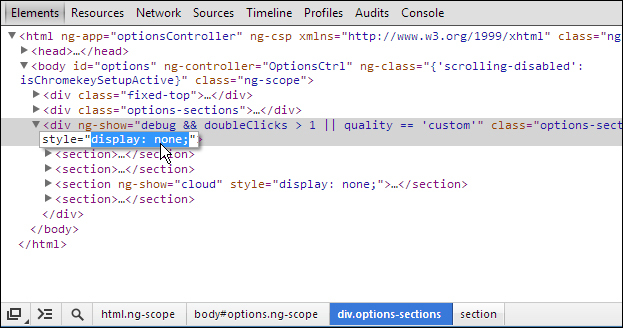 Remember that, need to delete the same DIV strings in the Inspect Elements section each time you plan on bringing these up. 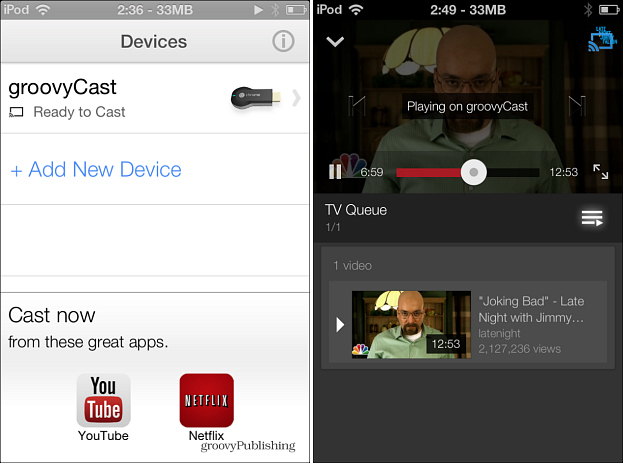 If you do not own an Android device, you may always install the Chromecast app on an iPad, iPhone, or iPod touch. Simple install and launch the app. It will help you locate your Chromecast device and allow you to use it to stream content from the YouTube and Netflix apps. 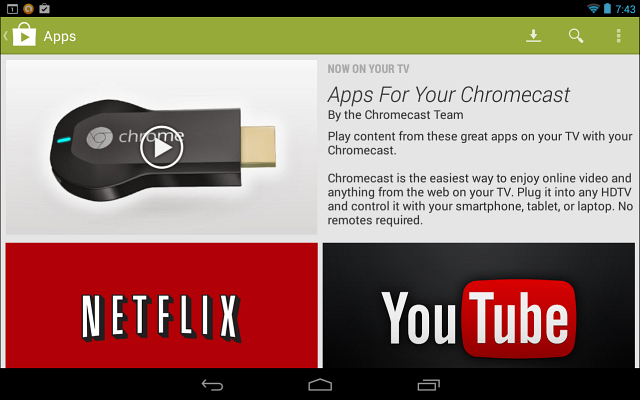 Do you like Chromecast? Have you discovered any other tricks about this app? Leave us your comment.